SOAR WITH THE EAGLES WEEKEND at The National Eagle Center is this weekend March 10th and 11th. Lisa Loucks Christenson will be the first speaker of the day on March 10th, 2007, discussing her eagle journey, now in its third year, with the same pair of bald eagles raising their offspring. 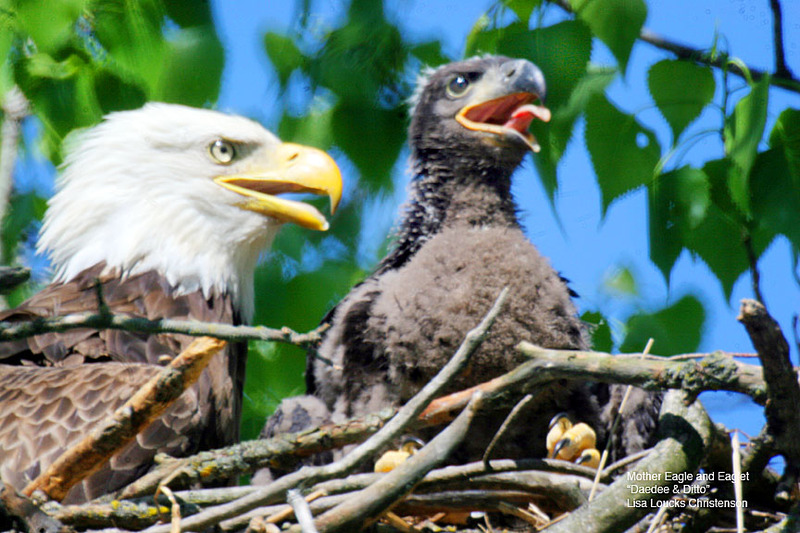 I'm offering the attendee's first peek at my rare and never-before-seen shots of the sibling eagles lives I documented, both on and off the nest. 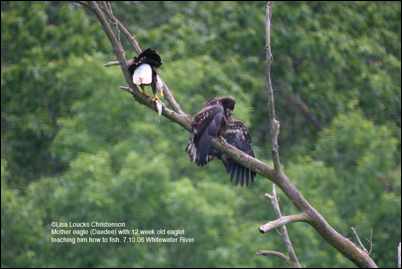 Says Loucks-Christenson, "I'm offering the attendee's first peek at my rare and never-before-seen shots of the sibling eagles lives I documented, both on and off the nest." 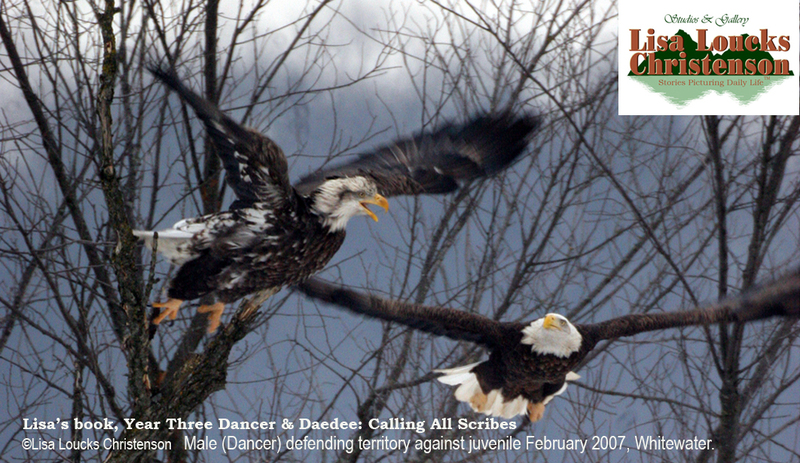 Loucks-Christenson was able to locate the eaglets for over ten weeks daily, after fledging and she continued their story for her second book on eagles, "Year Two Dancer & Daedee: Epiphany Season." Loucks-Christenson began her third book on this eagle pair in January of 2007, and visitors at The National Eagle Center will be the first to see the eagles survival in the wild while enduring -45 below with wind-chills, winter storms, blizzards, and the start of 2007's nesting season. "I wanted something that said 'survival' so I started a month earlier this year, and have been out there documenting the eagles, and wildlife while temperatures hit -45 below with wind chill for almost three weeks we had that cold snap. Then we got hit with a blizzard that lasted two days, and following that, another winter storm. The snow is up to my waist in some spots as I hike to my posts. Almost forty days into the project--I have my shots that speak 'survival'. I hope people will look at my work and see that it's not easy for these animals and birds out there," Loucks-Christenson added. Lisa Loucks Christenson is a national-award winning author & photographer based out of Rochester, Minnesota. Lisa recently completed her Walk the Burn documentary in the Whitewater Management Area. She's eager to share her stories for stalking and blending in with her subjects habitat allowing her to capture their daily lives in the wetlands. As a bonus, Lisa will give you an intimate look at the private lives of a pair of bald eagles raising their offspring during her three year journey. Mary Stefanski from the USFWS will give insight to identifying species found in the Upper Mississippi National Fish and Wildlife Refuge. · 11:00 a.m. & 1:00 p.m. "Conservation is about taking care of the places you love." He has worked on the Mississippi River for 38 years. Since coming to Audubon in 1998, Dan McGuiness has been directing a multi-faceted effort to build national awareness and advocacy for restoration of the ecological health of the 1,366-mile Upper Mississippi River and its 189,000 square mile basin. This exciting program will enable you to learn about the various raptors found in Minnesota and their role in the environment. You will learn the three key features of all raptors and how they are different from other birds. Meet the Eagles, Hawks, Owls and Falcons perched out on display with a representative from the U of M Raptor Center . Have the opportunity for one-on-one learning with the raptor specialist. Plenty of time to ask questions, take photos, or just relax and watch the raptors. 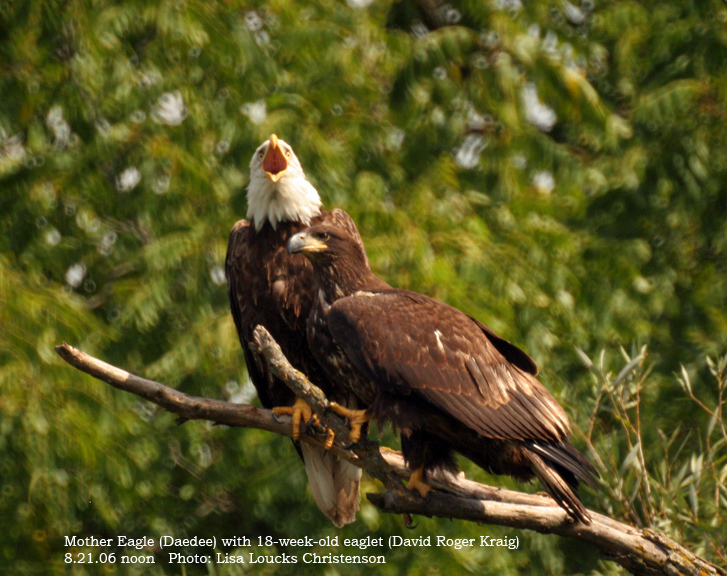 · 10:00 a.m. to 3:00 p.m.
Join either White Water State Park Naturalist Dave Palmquist or the National Eagle Center Program Special Scott Mehus on an exciting one and half hour narrated "expedition" of the Mississippi River valley area. Your guides enjoy sharing their knowledge of the the region's rich natural history and ecology. Questions are encouraged as you learn what makes the Upper Mississippi River one of the most important ecosystems for the Bald Eagle. Bring your camera for possible eagle (and other bird) sightings. Step back in time when Paddlewheel Boats traveled the Mississippi River. The Pearl of the Lake is an authentic replica... her only means of propulsion are her paddlewheels. Come aboard for a hour long cruise excursion allowing a unique point of view for eagle watching and viewing other migrating birds. · 11:00 a.m., 1:00 p.m. and 3:00 p.m.
See how the Natiional Eagle Center's eagles are trained and fed and learn what eagles eat in the wild. · 10:00 a.m. - 4:00 p.m.
A variety of fun children's activities willbe available for their enjoyment. Last year's photo contest was a grand success. It is now an annual part of Soar with the Eagles. Come see a whole new batch of photos, and pick up a calendar of last year's photos. We are planning a people's choice category this year so your vote matters. Enjoy a scrumptious brunch selection while viewing Bald Eagles on the Mississippi River. Our program features Al Batt of rural Hartland, Minnesota who is a writer, speaker, storyteller and humorist. Al, who was born and raised on a farm near Hartland, writes three weekly humor and nature columns for many newspapers, and does a regular radio show about nature on a number of stations. He is a contributing writer to the book, Minnesota Bird Watching. Al appears each week on "Memories and Musings by Al Batt" on KSMQ-TV. He has written for the movies. He speaks at various festivals, conferences and conventions all over the United States. He has been named Birder of the Year by Wild Bird Magazine.